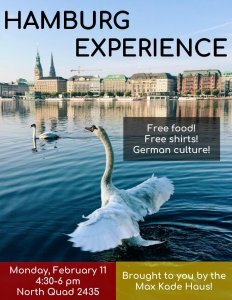 The Max Kade German Residence invites you to experience Hamburg (the city in Germany, not the food)! The second-largest city in Germany (and its largest port city), Hamburg is more than the pretzel and lederhosen stereotypes Americans may think of when they think of Germany. Come to the event for: free FOOD, free TSHIRTS, and German culture! Open to everyone in the U-M community.